Thanks for your support, it was great seeing all of you at the event! See you next year (or before)! Nice to meet you Peter! Peter's picture is on the Victory Lap or whatever it was called, where all competitors skate a lap together shortly after the 24 hours were over. The SLF team started at the back of the pack and skated behind the horde for most of the lap. We had some fun on the last 3/4 mile straightaway by getting into a paceline on the "wrong side" of the road (note the blue cones) and zipping by a lot of people. It was really fun to skate together instead of separately! Can you find out how the Flying Fossils are doing? They're a team of members 55 and older. Last I spoke to Stephen (around 11:00 a.m.) Sunday they were in 2nd place in their Fitness/Advanced category. An Ottawa team was first and their skaters were half the Flying Fossils age, I might add. I couldn't make the awards ceremony so don't know the outcome, but have checked the website and the results should be up soon. Just got back from Montreal and it was a great time as usual. Met up with some skating friends that I hadn't seen in a while. I got to meet a few of the skatelog team as well as Lawrence "More Cowbell". It was great to meet all of you. I hope you had as good a time as I had. Although, the weather at times was unbelievably nasty. I'm not sure of Team Skatelog's standing, but I do know that Lawrence came in the top 5 of the solo category. Eric Gee (last year's winner) was first. I must say though that I saw Lawrence a few times on the track and he looked as strong at the end of the event as he did at the beginning. And, what a great competitor he was --- saw him shaking Eric's hand and congratulating him on his win. Lawrence, it was such a pleasure to meet you and like I said to you in Montreal you did an amazing thing this weekend. I really, really hope that you come back next year and do it again. And I do hope that you had a good time despite the weather. I really felt for all of you soloists in that horrible rain during the night. I know how bad it was because I had the 11:00 - 2:00 shift with 2 other teammates and had to skate during that time. At one point the rain was so heavy that I couldn't see 6 feet in front of me and I almost went down a few times. I think that of all the laps I did I only had 2 or 3 dry ones. I also think the track was wet more than it was dry, but I might be imagining it because I began to think of myself as the "rainmaker". Everytime I went out it started raining. I know what a tough time I had and I have to say I really, really admire all those that were out there for the 24 hours. They are amazing. Just received an email from Stephen and the Flying Fossils came in 2nd -- got the silver medal. Good for them. Our paddock was beside theirs so I got a chance to meet those skaters I already didn't know and I've got to say "what a group of outstanding guys!" Sorry that these pictures don't do justice to the night and rain experience, but I was concentrating on the race and sleep/nap time. Looking forward to another 24 hours in Montreal in 2008! hey i think you did a great job on the pics,,,thanks. Hey Don, Great job with the race and photos. I want to hear all about it when I see you. Way to go! Most of them are similar looking exchange area pics. Hopefully some people out there find a picture of themselves. If there's a picture of you or you can identify some people, please leave a comment with a name or story. Here's the obligatory 80% of Team Skatelog picture. Peter, I didn't get a chance thank you for cheering me on when I passed you at one point while you were out jogging along the course. It was starting to become a tough lap for me at that point, and having that bit of friendly encouragement really energized me to kick it back up a notch. Have an awesome time at the Pan Ams my friend! And as for Sarah, she is amazing ... I suspect that she will continue to get faster and will win big time at the world level. I think you probably know that she is representing Canada at the Pan Am games and so is Peter. Those people are the true "elite" athletes, in my opinion. But, having said that, it will be a lot of fun seeing them compete at the 24 hour. The truly amazing thing about Sarah is that she was wearing rec skates when Morgan introduced us to her almost a year ago at the West Toronto track. She has natural talent and ability, but to achieve Elite status in such a short time, she has also demonstrated incredible drive and done a huge amount of hard work and put in long hours training over the past year. Having skated with her on short track ice at the Toronto Speed Skating Club out in Scarborough during the winter months, I'm of the opinion that she has even more potential if she chooses to cross over into that sport (or Long Track ice). Morgan Williams is here I think skating with Ottawa, actually a lot of Toronto Inline Skate Club members are with Ottawa. I think I saw Sarah Hopkins but I might be mistaken. 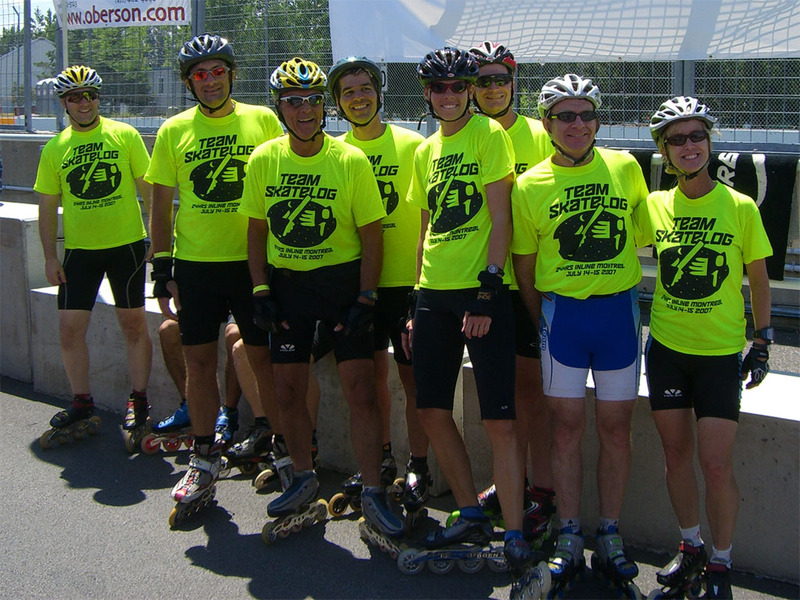 Five of us from TISC skated with Ottawa Inline. Morgan and Jesse were on Il Peloton's Skeletons in the Elite Category. Scott (or Mister Pauley as Peter insists on calling him) and I skated with the Rabid Lap Dogs in Fitness, and Carolyn was a last minute addition to one of the other teams (I can't recall the team name). The Sarah you saw in Montreal was a mirage. She stayed in Toronto to train. Sort of a related question ... read a while back that you stayed in Laval at a Hampton Inn. Our team is looking for a new reasonably priced hotel for next year and I'm wondering how the Hampton Inn was. Were there restaurants, grocery stores, etc close by? It was in a great area. Everything you noted above is within 1 mile. There's even a HUGE shopping mall within 5 miles off of Autoroute 440. It's about 15 minutes outside of Montreal. The traffic on the highways is a pain, but if you give yourself a little extra time, it's fine.